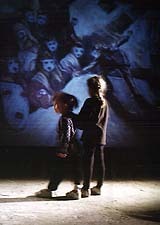 TANGO OF SLAVES, named after a popular tune from the Warsaw Ghetto, was produced by Ilan Ziv for his two daughters, in an effort to give them their own images of the Holocaust and their family history. Frustrated by popular Holocaust imagery, Ziv decided to take his father back to Warsaw, his former home. TANGO OF SLAVES is the story of that return, a physical journey that became a meditative essay about history, memory, and their preservation in imagery; a meditation which has been made more pressing as the Holocaust is being inevitably transformed from a living experience into motion picture drama. While Ziv's and his father's physical journey takes them through modern Warsaw, where the father was born and where the Ghetto stood, the meditative journey takes us far away into a world of dreams, photographs and visual representation of the Ghetto. In its failed attempt to find artifacts of his father's life in Warsaw, TANGO OF SLAVES explores the only traces of the past that are left - photographs and documentary material produced by German soldiers, private individuals or Ministry of Propaganda professionals. Early in the film, Ziv's father refers to himself as "The Last of the Mohicans." Out of 500,000 Jews that once lived in Warsaw, only a handful survived. "When we all die… it will become only a story… like the Trojan Wars." Alternating between telling his father's story, the present futile search for documentary proof of it, and a critical reading of the images that did survive the Ghetto, TANGO OF SLAVES raises troubling questions about our ability to transmit historical memories to future generations.